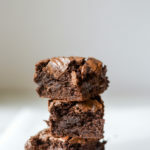 Thick, chewy and decadent–these brownies are good for any and every occasion. Heat oven to 325. Line 9X9 baking dish with foil, making sure to leave overhang. Combine flour, salt, baking soda in a small bowl and set aside. In a saucepan, heat the butter, sugar and water. As it starts to come to a boil, remove it from heat and add 6 ounces of chocolate chips and vanilla. Stir until it comes together in a smooth mixture. Add the eggs, one at a time, beating thoroughly. Add the remaining 6 ounces of chocolate chips. Spread into the baking pan and bake for 40-50 minutes. Towards the end of the baking time, check on the brownies. You want the center to be slightly underdone so that they keep their gooey consistency.